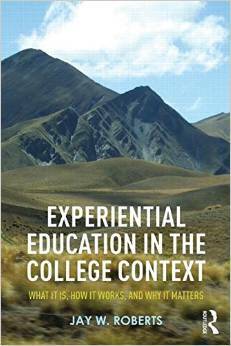 My new book, Experiential Education in the College Context: What it is, how it works, and why it matters, is currently in press with Routledge and due to come out sometime late this summer. You can check out the marketing copy and table of contents below. Experiential Education in the College Context provides college and university faculty with pedagogical approaches that engage students and support high-impact learning. Organized around four essential categories—active learning, integrated learning, project-based learning, and community-based learning—this resource offers examples from across disciplines to illustrate principles and best practices for designing and implementing experiential curriculum in the college and university setting. Framed by theory, this book provides practical guidance on a range of experiential teaching and learning approaches, including internships, civic engagement, project-based research, service learning, game-based learning, and inquiry learning. At a time when rising tuition, consumer-driven models, and e-learning have challenged the idea of traditional liberal education, this book provides a compelling discussion of the purposes of higher education and the role experiential education plays in sustaining and broadening notions of democratic citizenship.